If, like me, you read about the teenager who allegedly made $72m on the stock market with his tutoring money (yes, he was lying, big surprise) and thought ‘maybe I could do that with a bit of seed money,’ listen up. Nenx is aimed squarely at you. 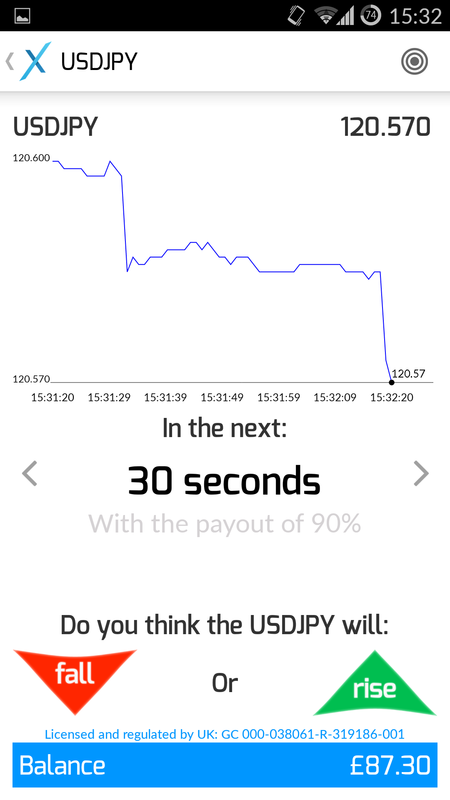 It’s an iPhone and Android app designed to make trading on the global markets and commodities really, really simple. So simple that anyone over 18 can do it with a pound and a phone. This, as we’ll see, is both a good and a bad thing. First off, you have to sign up for an account and prove you’re over 18. I gave some basic information about myself, but Nenx wasn’t able to verify I was an adult from that, so they asked for my driving licence, passport or a utility bill to prove it. This is a faff, yes, but it’s very much needed to keep children and teenagers from spending their parents’ life savings. 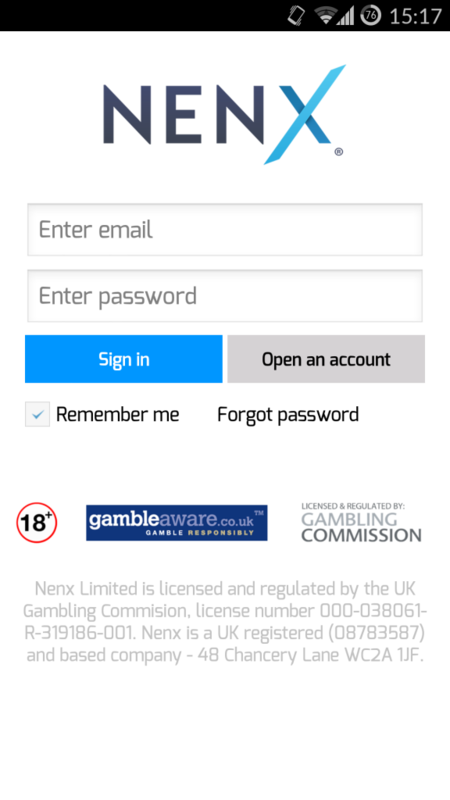 Nenx comes across as a very security-conscious app in general, always giving you the terms and conditions before you make a bet so you understand what you stand to win and lose, and frequently mentioning that it’s licensed and regulated by the Gambling Commission. The login screen shows the Gambling Commission and Gambleaware’s logos, and there’s an option to use a PIN whenever you open the app. This is all pretty reassuring. Once you’re in, you load up your account with money (the minimum is £10, and I’d recommend starting with this because it’s very addictive) and start trading. I’m guessing this is a glitch and it should just say “market closed”, but it’s hard to tell. Some information about when each market is open and closed would be nice, too. 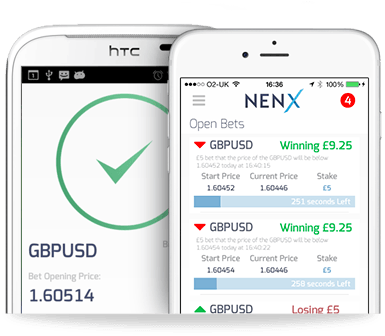 Placing a bet with Nenx is a really simple process, basically just the trading equivalent of ‘higher or lower.’ You bet on whether the price of whichever thing you’re trading in (crude oil, for instance) will go up or down from the moment you placed the bet. You can choose a length of 30 seconds, a minute, 2 minutes or 5, although some markets (like Bitcoin) will only let place 5 minute bets. The app shows you on a real-time graph how the price is changing, and you make your best prediction as to which way it’ll go. If it’s just dropped hugely, for instance, you can try and get in quickly with a 30-second bet that it’ll go back up. You quickly learn that 30 second bets are far, far more fun than longer ones – the excitement of watching the price go up and down and praying you were right is much stronger when you’ve only got 30 seconds to wait rather than a whole 5 minutes. You choose how much you’d like to wager (although you can also set up a one-tap standard bet, eg. always bet £5 for 30 seconds), then sit back and cross your fingers as the market rises and falls. I can’t emphasise enough how fun this is. It’s absolutely thrilling. You place your bet and will the line to go up, up, up, just a little bit – and then it does, and you wait out the last few seconds – 6, 5, 4, 3, 2, 1 – like an eBay auction, heart in your throat, hoping it’ll stay up. And it does, and you win about £4 (on a £5 bet), and you feel like Jordan Belfort. Of course, you lose just as often as you win. Or at least you do if you’re betting like me, with no knowledge of the markets, just seeing a general trend (it’s going up! That means soon it’ll come down!) and jumping on it. Someone with a little more knowledge and skill could do really well. Over the two weeks I’ve been using Nenx, I’ve had some issues with the app itself. If it’s running in the background and you lose internet signal (like when you get on the tube), the Nenx login screen will pop up on top of whatever you’re doing (reading ShinyShiny, obviously) and demand you log in again. The only way to stop this is to close Nenx from running apps, but it’s quite annoying. Similarly, I’ve been prompted to log in again several times during betting, for no apparent reason. Currently, I can’t use the app at all because it’s popping up an error saying it needs my location. There’s nowhere to tell it my location, so I called customer service, who admirably answered instantly on the 23rd of December. Apparently, it’s because my phone isn’t giving a GPS location, so Nenx can’t be sure I’m in the UK – their very patient representative explained that their license strictly only covers this country, so they can’t risk anyone using the app from elsewhere. That’s all well and good, but having rebooted my phone and the app, gone outside and turned on high-accuracy GPS, Nenx still says it doesn’t know where I am. And therefore I can’t do anything with it. 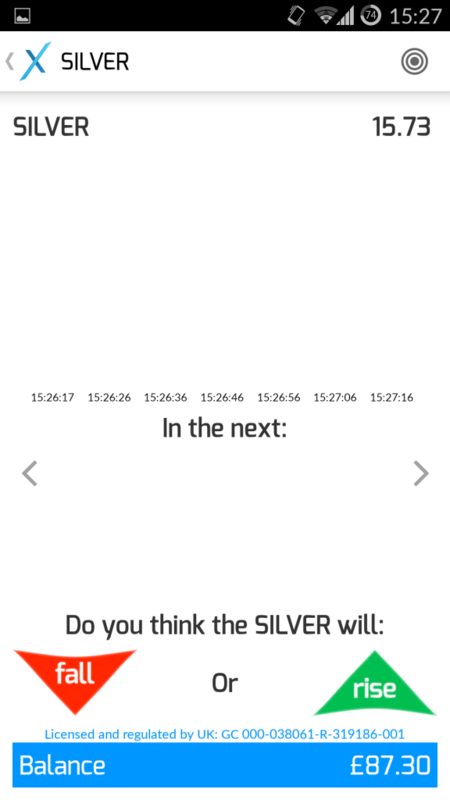 Nenx’s rep assured me it’s something they’ve fixed in the next version of the app, but for now, it’s frustrating. I want to bet on Bitcoin, dammit! So have I made my fortune? I started with £100 credit in the Nenx app. After two weeks, I have just over £87, but it’s been as high as £150. It rises and falls in line with chance, 50/50, because I’m literally betting on up and down and it goes my way as often as it doesn’t. The only way I’ll get rich on this app is if I place a big bet, win it, withdraw my money and bow out. But we all know that’s not how it goes. And that’s the danger with Nenx. It’s so fun, so easy, so addictive, that it’s really not a good idea if you haven’t got money you’re happy to lose. So go into it with your eyes open, fully expecting to lose every penny you put in, so that if you don’t, it’s a bonus. Not something you’re relying on. 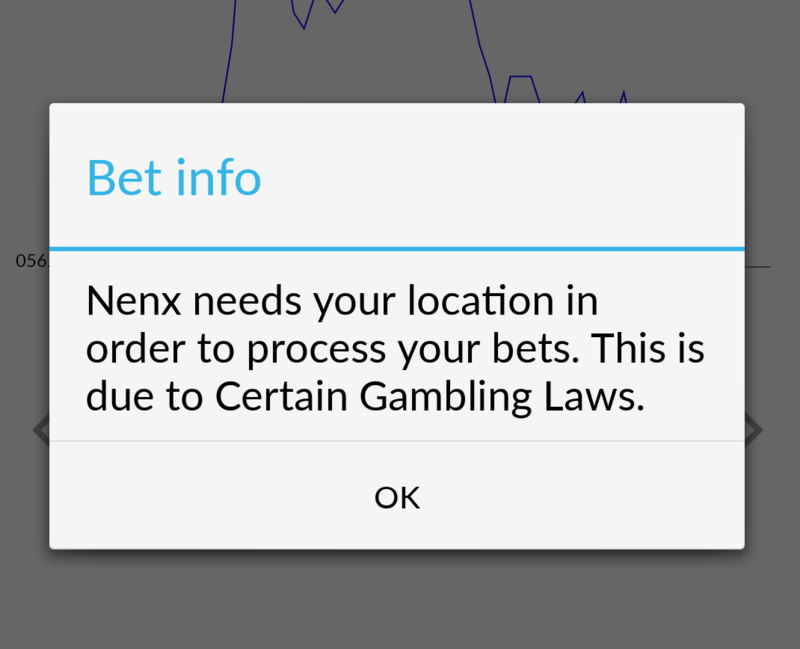 Nenx are commendably conscientious about gambling addiction. You can set a maximum spend limit for the week, and even ban yourself from the app for anything from 6 months to 5 years. It’s just that they’ve built an app that’s so simple and enjoyable, it’s a bit risky if you’re light on willpower. Nenx has a few teething glitches, but delivers its premise brilliantly: it’s fun, it’s easy, and you win real money that you can withdraw anytime. Try placing a 30-second bet and see if you don’t get addicted. You may not end up having breakfast with a chest-thumping Matthew McConaughey, but it’s an easy way to see if you’re really cut out to be the trading supremo you’ve always imagined. You can get the Nenx app free from the iTunes store and Google Play.